14ymedio, Yoani Sanchez, Havana, 28 August 2014 – « I need some dark glasses, » Veronica told me one day when I ran into her on the street. Almost seventy, the lady underwent cataract surgery some months ago and now must « take care of my eyes, » as she explained to me. She works in the sun selling jabitas (plastic bags) to the customers of the farmers market on Tulipan Street. The harsh midday glare is hard on her eyesight, but that’s not the worst of her problems. « We have an alarm system to know when the police are coming, although sometimes they’re in plainclothes and catch us by surprise. » Last month she paid a 1,500 Cuban peso fine (roughly $60 US) for engaging in illegal sales, and this week she received a warning letter for recidivism for the same offense. If you read articles like Randy Alonso’s about the absence of bags in the hard currency stores, you might come to believe this resource is being diverted into the hands of unscrupulous traders. However, it’s enough to simply know Veronica to understand that her business is one more of misery than of profit. For the four decades she worked as a cleaning assistant in a school, the lady now receives a pension that doesn’t exceed ten dollars a month. Without the resale of the plastic bags, she would have to beg, but she asserts that she « would die before asking for money in the streets. » She is not to blame, rather she is a victim of the circumstances that have pushed her into an illegal activity to survive. 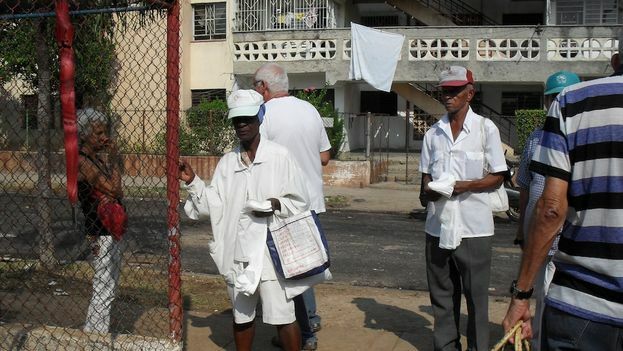 next post: Who Is Filling Cuba’s University Classrooms?